Karan Johar has a unique sense of fashion and seems like his twins Yash and Roohi Johar are following their daddy’s footsteps. 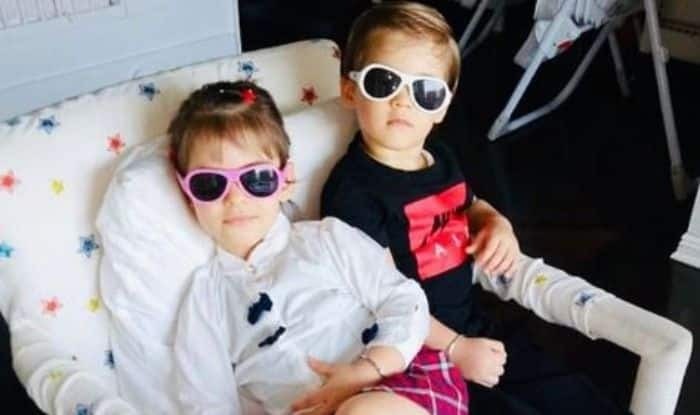 A while back, the filmmaker, who keeps sharing hilarious pictures and vidoes of his twins on Instagram shared another picture where the two can be seen giving a stylish pose with their fancy outfits and colourful shades. Karan, took to his Instagram to share a picture of twins Roohi and Yash and wrote, “Baby vogue!!!!! #mylovestory.” Just like their daddy Karan, his twins also seem to be a lot into fashion. Karan keeps sharing videos of his kids on Instagram and it is just too cute to handle. Earlier, he shared a video where he is seen asking Roohi and Yash to dance while they sit on their toy car. Seems like Karan is already preparing his kids for the big screen. In the video, Yash got excited and hugged his sister, Karan too could not resist the cuteness and said, “so much love.” What Karan said after, was hilarious. Roohi, put her head down on the steering and Karan passed a funny comment and said, “Roohi, why have you passed down on the wheel? Excuse me, please don’t drink and drive.” The very next moment, Karan burst out in laughter himself. On the work front, Karan has been busy with his show, Koffee With Karan. The Kuch Kuch Hota Hai director is also busy being a producer for movies like Kesari, Kalank, Student Of The Year 2, to name a few, under the Dharma Productions banner. The show’s last episode this season will feature Kareena Kapoor Khan and Priyanka Chopra. Karan’s recently produced film Simmba is doing wonders at the Box Office and has entered the Rs 200 crore club on day 12. Starring Ranveer Singh and Sara Ali Khan, the film is directed by Rohit Shetty.